In response to the ongoing crisis of leadership in the Roman Catholic Church, our home parishes in the Catholic Community of Gloucester & Rockport are gathering on a regular basis to pray for the healing of God’s family and the rebuilding of God’s church. In anticipation of the Feast of Saint Oscar Romero, we gathered in adoration of the Blessed Sacrament to pray the Holy Rosary and to pray for the intercession of a martyred bishop who gave his life for the gospel. During our vigil of prayer, we heard a collection of quotations that were combined into a coherent, challenging, and inspiring message for those who seek to live the Gospel, share God’s love, and rebuild our Church. These are the words of Saint Oscar Romero, Bishop & Martyr. Christianity is not a collection of truths to be believed, or laws to be obeyed, or prohibitions. All of that makes it very distasteful. Christianity is a person, one who loved us so much, one who calls for our love. Christianity is Christ. One day, there will be no more Masses, no more need of priests, because all of us, through the labors of priests, bishops, catechists, lay ministers, and all of God’s people, will achieve humanity’s incorporation into Christ and Christ will be the one priest. [Until that day] if we want to find the Child Jesus, we should not look at the lovely figures in nativity scenes. We should look for him among the malnourished children who went to bed tonight without anything to eat. We should look for him among the poor newspaper boys who will sleep tonight on doorsteps, wrapped in their papers. Blessed are the poor, because they know that their riches are in the One who being rich made himself poor in order to enrich us all in his poverty; teaching us the Christian’s true wisdom. God tells the poor, as he told the oppressed Christ as he carried his cross, ‘You will save the world by making your suffering a protest of salvation…You will save the world if you die in your poverty while yearning for better times, making your whole life a prayer. What does God want from the political power in our country? He wants it to create sound laws and moral unity among all people for the common good. God does not want this power to be used to assault or to beat people or to attack cities and villages; that is perversion. What does God want from capitalism and from those to whom he gives money, property, and other things? God wants conversion. This means that we should bestow on the things created by God the destiny God ordains for them, which is the welfare of all people, so that everyone might have a small share in happiness (53). It is no use to have lots of money, lots of power, and lots of luxury if we are not converted to God. If God does not justify you, then you are the poorest of the world’s wretches (61). We are all sinners and we have all contributed a grain of sand to the mountain of crime and violence in our country. Some people think that the Church meddles in politics and other areas where it has no business. But they must understand that we are simply preaching the kingdom of God, which means pointing out the sins of society, even when the sin is found in politics or money. This is what the church wants: to disturb people’s consciences and to provoke a crisis in their lives. A church that does not provoke, a gospel that does not disturb, a word from God that does not irritate, a word from God that does not touch the concrete sin of the society in which it is proclaimed — what kind of gospel is that. How different our country would be if we were harvesting what God has planted here. If only we had people of prayer among those who direct the destiny of our country and the destiny of our economy! If only they relied more on God and his teachings…then we might have a world that the church dreams about: a world without injustice, a world respectful of rights, a world where all people share generously, a world without repression, a world without torture. It is easy to be servants of the word without disturbing the world in any way. We can spiritualize our words so that they lack any commitment to life as it exists. We can speak words that sound good in any part of the world because they say nothing about the world. Such words create no problems; they give rise to no conflicts. [But] the word that characterizes the authentic church in the world is the word that causes conflict and invites persecution. It is the searing word of the prophet that announces and denounces: it announces the marvelous works of God so that people will believe and worship God, and it denounces the sins of those who oppose God’s kingdom…The true word denounces sin so that it can be uprooted from people’s hearts, from our society, from our laws, and from all those organizations that oppress and imprison and trample on the rights of God and his children. Let us pray that the fanatics of violence and terrorism, as well as those who think repression and force will fix our problems, can learn that these are not the ways of the Lord. Rather, the ways of the Lord are love and respect and obeying the law of the Lord; these are the humble ways of Christ. Let us never tire of preaching love. It is the force that will overcome the world. The greatest disease in our world today is not knowing how to love. Everything is selfishness. Everything is exploitation of others. Everything is cruelty. Everything is violence and repression. When we are tempted to act with vengeance, resentment, cruelty, or selfishness, let us not consider the sad example of those who hate others. But let us raise our eyes toward the love that becomes the lamb, becomes food, becomes Passover, and becomes covenant. According to Christ, being a Christian means being leaven. Bakers know how the little bit of yeast that is placed within the dough leavens the entire loaf. This is what Christians should be: the smidgen of yeast that goes on to transform families, neighborhoods, communities, towns, our entire country, and the entire world. The church’s laws, dogmas, and beliefs must be transformed into life…Those who do not want to understand the church in this way are not worshiping the eternal living one, Christ, who will never die. We worship a living God who walks with living people. The best microphone of God is Christ, and the best microphone of Christ is the church, and the church is all of us! What God wants is to make the whole world one great community. In Christ, all of us are called to the wealth of God’s kingdom. We are all members of the same body…God did not make us to live dispersed and divided. We need each other. This is the church: the coming together of those who believe in the true God and in Christ the Redeemer…The gospel path leads the way: through poverty of spirit, through the struggle for justice; through the sowing of peace. Let each one of us, according to our abilities, nurture this vocation to become instruments of peace…There are those who seek only security and comfort, who will not risk poverty, who will not detach themselves from their prosperity, not even in spirit. These people do not work with God. This poverty in spirit flows from love for Jesus Christ. It is poverty that beholds Christ naked on the cross and says: “I will follow you wherever you go. I will travel the road of poverty because I love you. Blessed are the pure of heart: those whose hearts feel the need for God; those who find the joy of life in the cross and in sacrifice; and those who have learned the true secret of peace in the crucified one…This secret consists of loving God to the extreme of letting oneself be killed for himand of loving one’s neighbors to the point of being crucified for them. This is the love of the modern redeemers, the love of Christ, the love that endures forever. Only these people are the true peacemakers that Christ blessed in the Beatitudes. Let us think of the campesinos (the poor) who even now are traveling in search of a better life. Let us not forget them because they are the face of Christ…The face of Christ is dying of hunger in the children who have nothing to eat. The face of Christ is the needy person who asks the church to speak out…How can we refuse to speak when Christ tells us to speak for him? At the final judgement, I do not want to be left back, hearing these words: “Depart from me, you accursed, into the eternal fire, because I was hungry and you gave me no food. I was needy and you did not care for me (Matthew 25:41-42). You were more concerned about the purity of your orthodoxy; you were more concerned about quiet time for your own prayers…You did not want to contaminate yourself with addicts. You were worried about your own economic, political, or social prestige. That is why you despised those who asked for your help. There I was with them. This is the standard by which Christ will judge us. Good works are the splendor of the church. But notice that the scriptures insist on good works for the sake of the poor…How can the church not be pained by a civilization of selfishness, a civilization of cruel inequality, where the poor, the helpless, the hungry, the naked, and the homeless must exist as if they were not persons, not our own brothers and sisters? Let us live by doing good works. When we do this, our light will break forth like the dawn; our wounds will be healed; our vindication will lead the way; and the glory of the Lord will defend us (Isaiah 58:8). This is the glory that follows the church and follows those who live with justice and charity. This is why every one of us in this church must be inflamed with justice, freedom, equality, and the defense of human rights, viewing everything in the light of our faith. God gives us one rule by which to judge whether He is near us or far away from us: God is near to all who are concerned for the hungry, the naked, the poor, the missing, the tortured, the imprisoned. All who draw close to suffering flesh have God near at hand. Religion does not consist in just a lot of praying. Religion consists in the promise of God drawing close to us because we lend our hands to our sisters and brothers who need us. This is where God lives. The degree to which we approach the poor and how we approach them, whether with love or scorn, determines how we approach God. What we do to the poor, we do to God. The way we look at them is the way we look at God. Brothers and sisters, I ask you to view these things that are happening in our time with a spirit of hope, generosity, and sacrifice. Let us do what we can. We can all dosomething. We can all be more understanding…If we enlighten with Christian hope our intense longings for justice and peace and all that is good, then we can be sure that no one dies forever. If we have filled our work with a sense of great faith, love of God, and hope for humanity, then our labors will lead to the splendid crown that is the sure reward for sowing truth, justice, love, and goodness on earth. Our work does not remain here…it is gathered and purified by the Spirit of God and returned to us as a reward. These are the last words of Saint Oscar Romero, Bishop & Martyr. By Christian faith, we know that at this moment, the host of wheat becomes the body of the Lord, who offered himself for the redemption of the world; and that the wine in this chalice is transformed into the blood that was the price of salvation. 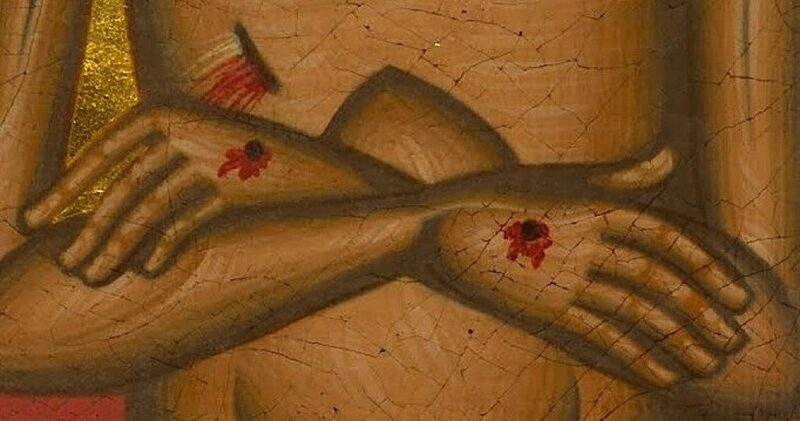 May this body and blood that were sacrificed for allpeople also nourish us so that we can give our bodies and our blood to suffering and pain, as Christ himself did, not for our own sake, but to bring justice and peace to our people. Let us therefore join closely together in faith and hope at this moment of prayer. These are the words for which he was murdered. Archbishop Romero (1917-1980) was shot once through the heart while celebrating Mass on March 24, 1980. He offered his life for the healing of God’s family and for the rebuilding of God’s Church. He offered his life for the poor, for the oppressed, and for the forgotten. He died a martyr for the Gospel. His murder has never been brought to justice. Saint Oscar Romero, Bishop & Martyr, pray for us! Our Lady, Queen of Peace, pray for us!